The fiftieth anniversary of the Medz Yeghern [Great Calamity], the Armenian genocide, became a watershed in the process of commemoration, as Armenians mobilized throughout the world to demand justice. The commemoration in the Armenian diaspora, including marches and public events in different capitals, was overshadowed by the unprecedented and unexpected explosion of popular feelings in Yerevan, the capital of Soviet Armenia. 1915 had been practically a taboo subject during the long night of Stalin’s repressive regime, and only after 1955 was there a gradual opening on the issue, which was coincidental with the “thaw,” the period of Nikita Khruschev as secretary of the Communist Party of the Soviet Union. After the transition of the 1950s, the “thaw” actually reached Armenia with the designation of Yakov Zarobyan as first secretary of the local Communist Party in 1960. Gradual, but firm steps to restore public memory within the limits of what was ideologically permissible followed, including painstaking negotiations within the highest echelons of the Soviet hierarchy. The Soviet Union was disinclined to active confrontation with Turkey, and thus, in early March 1965 the party leadership in Moscow allowed very reluctantly the commemoration of the genocide. An official event by invitation had been planned for the evening, to be held at the Opera Theater. Everything seemed under control, but it was not. In the morning, several thousand young people gathered at Lenin Square (now Republic Square), near Lenin’s huge statue (toppled in 1991) and various speakers among them started to talk about the meaning of the day. Several leaders, such as Anton Kochinian (president of the Council of Ministers) and famous astronomer Victor Hambardzumian (president of the Academy of Sciences), also spoke to the audience. After they left, the public, whose number had reached an estimate of no less than 30 to 40,000 people, formed an orderly caravan that walked through the streets of central Yerevan. 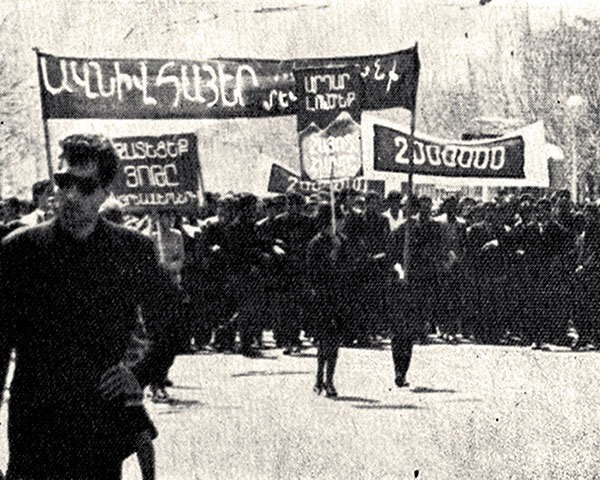 The demonstrators marched with calls of “Our lands!” and carrying banners that said, for instance, “2,000,000” (the number of victims) and “Solve the Armenian question fairly.” Their number appears to have grown up to 100,000 people, according to some accounts. 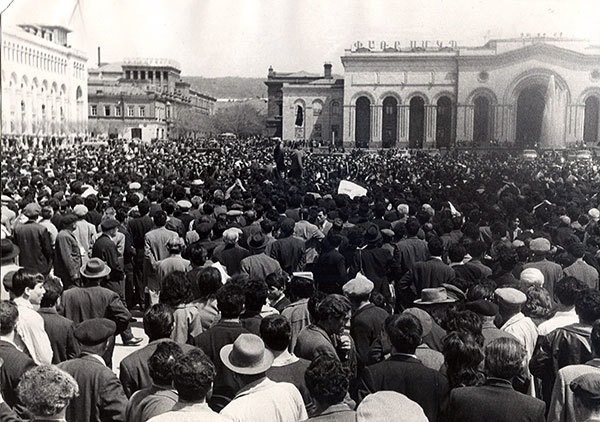 The demonstration, after stops at the Polytechnic Institute (now State University of Engineering) and Yerevan State University, walked towards the tomb of Gomidas Vartabed in the Pantheon, where several writers, scholars, and young people spoke. The demonstration continued in the evening, and the marchers tried to force their way into the official ceremony at the Opera Theater, which was surrounded by several police lines. They were repelled by the use of the fire sprinklers of the theater. However, a hundred or two hundred young demonstrators managed to enter the building. The event, where Nagush Harutiunian (president of the Supreme Soviet) and Victor Hambardzumian, had already spoken, was disrupted. The party leadership left the stage, as well as many in the audience. Catholicos of All Armenians Vazken I took the stage to calm the demonstrators. The failure to prevent the demonstration would lead Moscow to various punitive measures, including Zarobyan’s removal in February 1966. However, the commemoration would become a tradition year after year. The first monument was dedicated in the courtyard of Holy Etchmiadzin in October 1965, followed by the memorial on the hill of Tsitsernakaberd inaugurated on November 29, 1967. Starting in 1975, the leadership of the country would join the hundreds of thousands of mourners who every April 24 would pay their respects at the memorial. In November 1988, following the impact of the Karabagh movement, the law “On the condemnation of the genocide of the Armenians in Ottoman Turkey in 1915” would also make a provision to declare April 24 a national holiday.